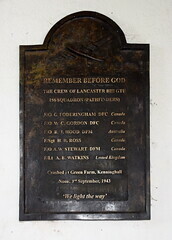 Kenninghall, the village, is surrounded by other villages which are far better known, although not necessarily for their churches. 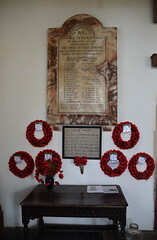 Banham has its zoo, Bressingham its gardens and Quidenham has its convent and the Norfolk children's hospice. 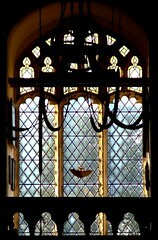 So it comes as a surprise to discover that Kenninghall is a large, comfortable, self-sufficient kind of place, and its great church is grander, and perhaps more interesting, than those of its neighbours. St Mary stands in an imposing position above the road, the south side particularly striking with its big Perpendicular windows and a clerestory of five small double light windows. There never was an aisle on this side. The tower is big and bulky. Mortlock says that a spire was intended, and the money for it committed, by the Duke of Norfolk, whose shield can still be seen on the south-east buttress of the nave. But Norfolk was imprisoned for treason before it could be built, his assets frozen, and then, of course, the English Reformation intervened. St Mary is exactly the kind of church which would be better known if it was in another county and not so much off the beaten track. You step into a large, urban church, full of confidence, and with more than a few survivals of the building's late-medieval and early-modern life. Best of all is the tympanum bearing the royal arms of Queen Elizabeth, one of only four sets in all East Anglia. 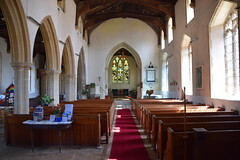 It has been fixed at the east end of the north aisle, but you can still see that it was shaped to fit the chancel arch. 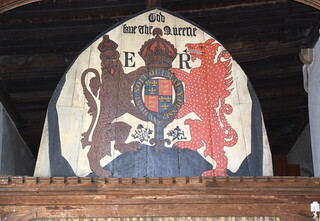 God save the Queene, reads the legend, a crowned lion and a gorgeous speckled red dragon flanking the Tudor arms. 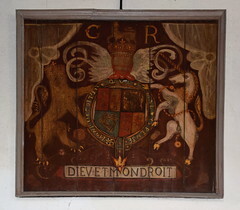 This is a much simpler affair than the more famous, and more elaborate, Elizabethan arms a few miles off at Tivetshall. Here, the arms are cleanly drawn and charged with the quiet triumph of Protestantism. As if that wasn't enough, the church also has the arms of Charles I hanging above the north door. 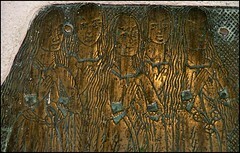 On the other side of the church there are fragments of a large brass. The main figures are gone, but surviving are the two groups of children. These have been reset on a wall, so if there is a fire they will melt - floor-mounted brasses don't melt in fires - but at least it makes them easy to look at. With them are a pair of image brackets remounted from elsewhere, one of them ornate with fleurons. 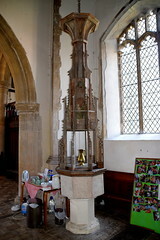 Roughly contemporary with the brasses is what must have been a magnificent towering font cover. 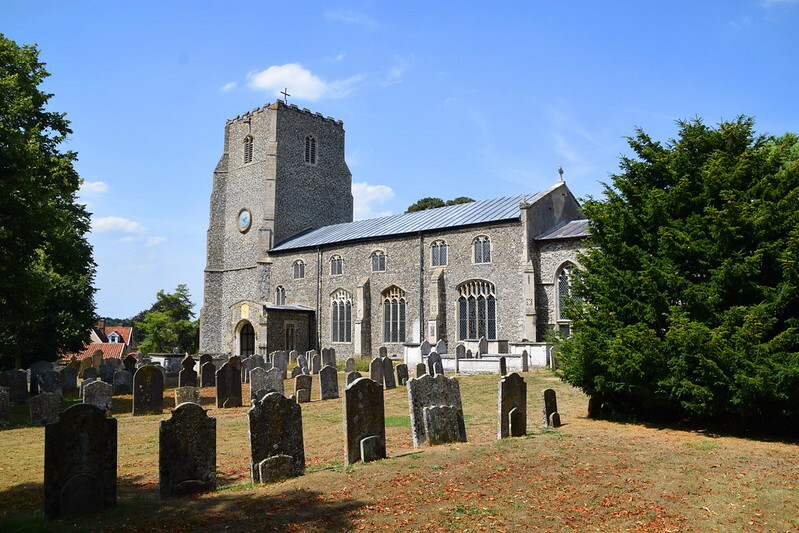 It rises like a steeple, familiar in style from elsewhere in Norfolk at Elsing and Walpole St Peter. 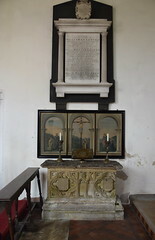 Similarly battered are the remains of a medieval table tomb with empty brass inlays, pressed into service as a side altar in the chancel. 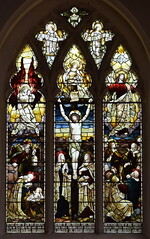 The glass is pretty much all of the 20th Century, although you might be forgiven for thinking otherwise because the east windows and chancel south windows by Heaton, Butler & Bayne are all still very much 19th Century in style, based on workshop cartoons used up to half a century earlier. 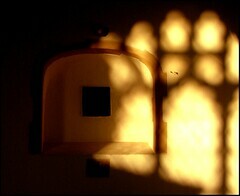 In fact, the earliest window here is from 1900. The best of them is the 1960s one on the south side of the nave depicting the figures of the East Anglian Saints Felix and Walstan. 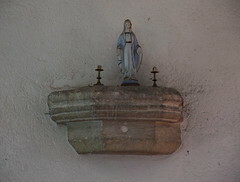 Lively and animated, St Walstan swings his scythe and the evangelical St Felix holds a lighted candle and an open book. 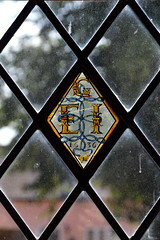 They are by Paul Jefferies for King & Son of Norwich. The only earlier glass survival is a delightful single quarry depicting a marriage knot of 1636. 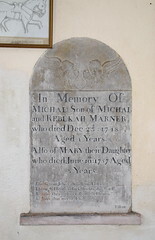 Its jauntiness is countered by the sobriety of the small, simple memorial reset against the tower arch to two young children, Michael and Mary Marner, who died seven years apart in the middle of the 18th century. A verse explains that The Great Jehovah full of Love through Death's dark shades did send to take these pretty spotless Doves to Joys that never End, which must have been small comfort, even in those days.